THERE’S a dusting of frost in the hollows and fresh snow on the higher peaks. A cold early-morning breeze steals down the valley and rustles branches above a forest car park. Strange to see bushes laden with oranges on the drive to Nerja, and fields of peas on the outskirts of Salobreña. Doesn’t look like the middle of winter – although in the icy dawn shadows it certainly feels like it . 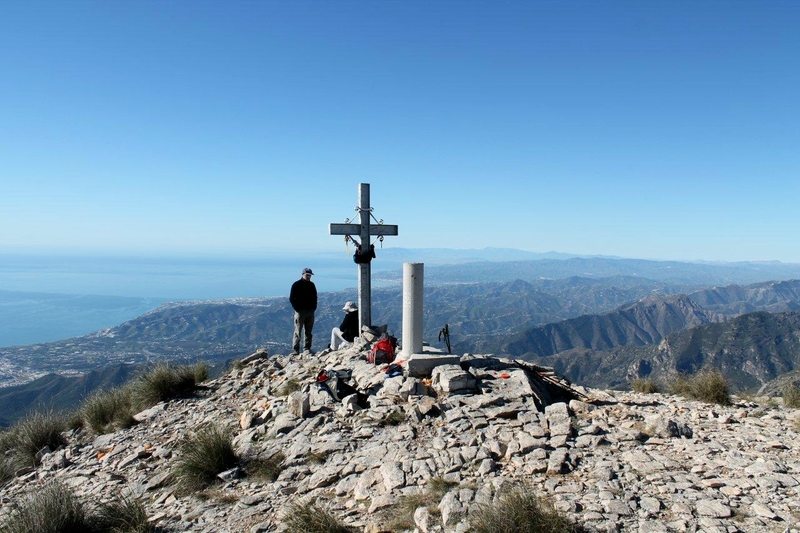 . .
Nerja is a holiday resort on Spain’s Costa del Sol. 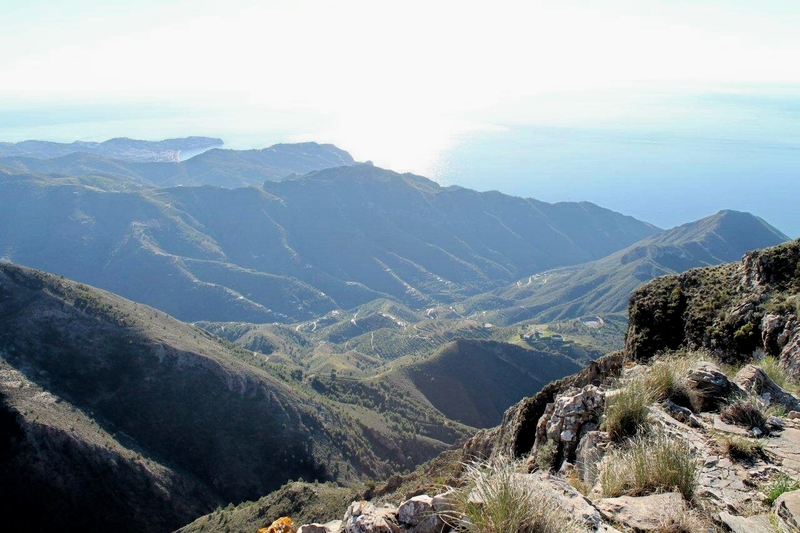 It has some famous caves – Cuevas de Nerja – which are certainly worth a visit because they are spectacular. 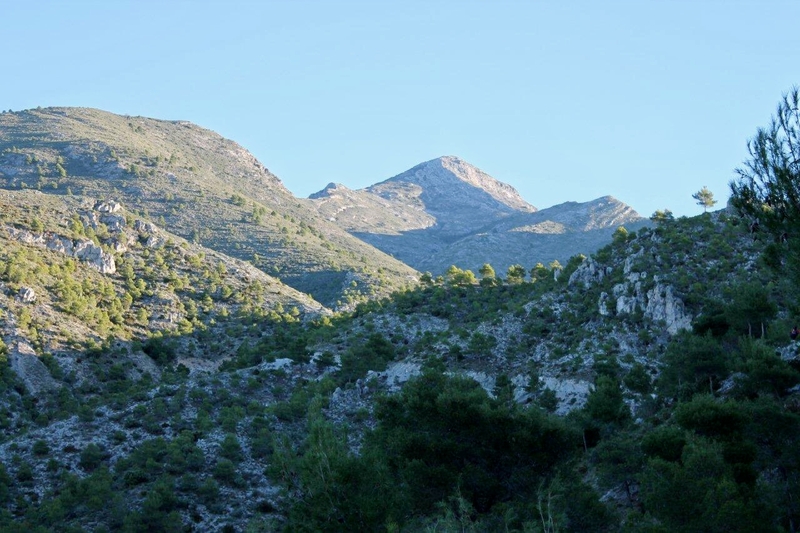 Just to the left of the entrance to the Cuevas de Nerja car park is a dirt road that bumps into the mountains. A barrier prevents vehicular access during the summer months, but in winter the barrier remains open. 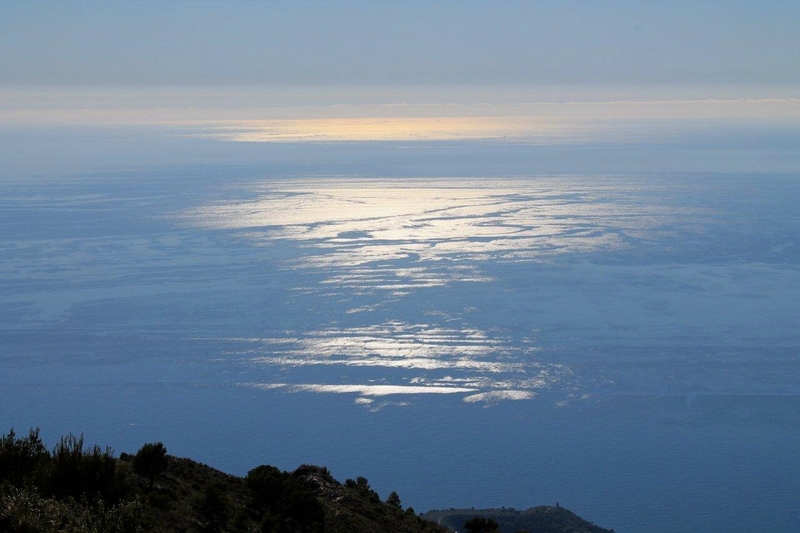 So I’ve driven slowly and dustily for a couple of kilometres to an open place where cars can be parked, with the intention of climbing Alto de Cielo, a fine rocky mountain that rises above Nerja and the blue, blue Mediterranean (Click pictures for high-res versions). 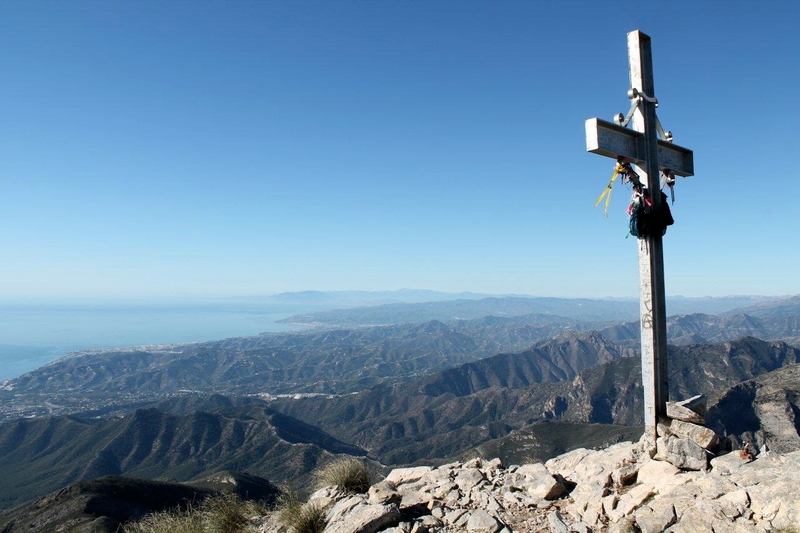 And this morning, returning like one of the swallows, the name flashed in the headlights as I circumvented Nerja. Now I’ve got four blokes in my head singing in harmony. They reach the end of the song and I think it’s over, but that signature Ink Spots guitar intro starts again and they embark on the next cycle. Hey-up, here they come again. Dumpty dumpty, dumpty dumpty, dumpty dumpty, dum . . . When the swallows come back to Capistranoooo . . .
Cielo is a leisurely 1,510 metres (4,954ft) high. 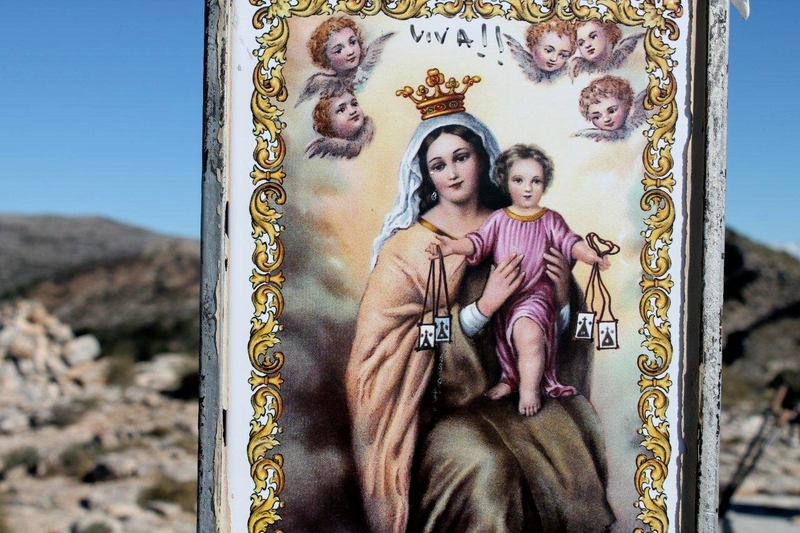 I clump up a dirt road for several kilometres with my four cheery though invisible friends to an abandoned farm called Cortijo de la Civilia, which appears to be a cluster of ruins inhabited by hippies. There’s a yurt with a stove-pipe beneath the trees on the far side of a river and children’s voices echoing happily around the valley. Yurts are not uncommon in this part of Spain. Andalucia has quite a vibrant alternative community. 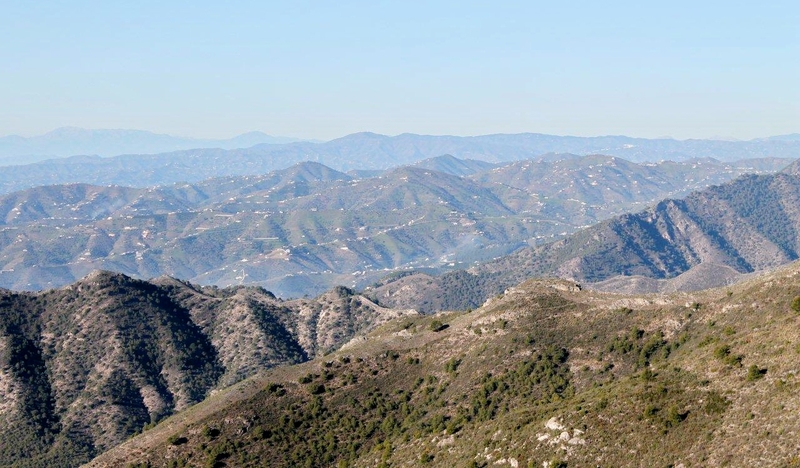 According to Charles Davis in his guidebook Walk the Axarquia (Sierra Tejeda y Sierra Almijara), the farm takes its name from a former occupant, a woman who had a penchant for wearing a Civil Guard uniform. Quite why, no one appears to know. But it takes all types. 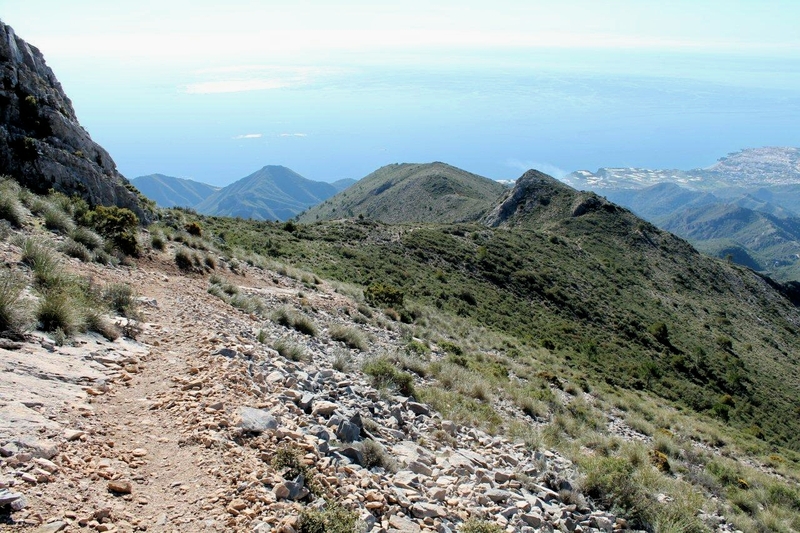 Above Cortijo de la Civilia the dirt road melts into a stony path that zigzags extravagantly to Cuesta del Cielo, the rocky end of Cielo’s southern ridge, then continues directly to the summit up some steep and sometimes slabby ground. 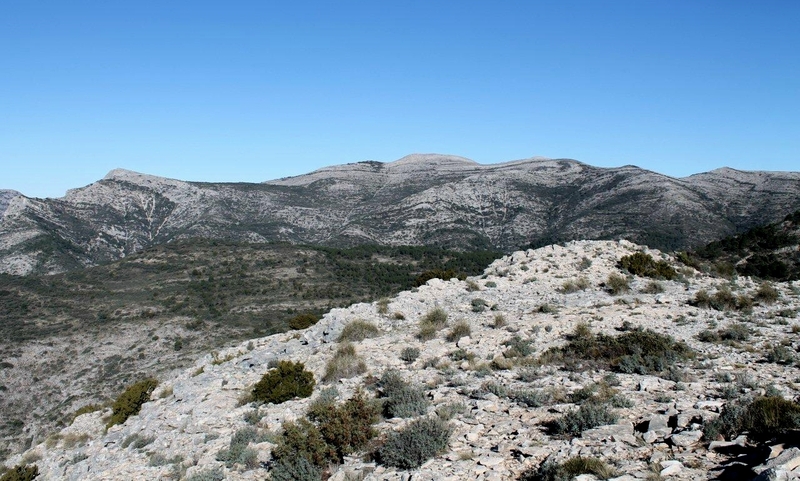 Small cairns and occasional splodges of red or blue paint mark the way across bare rock and through patches of scrub. It’s all pretty straightforward. Ask my mates. 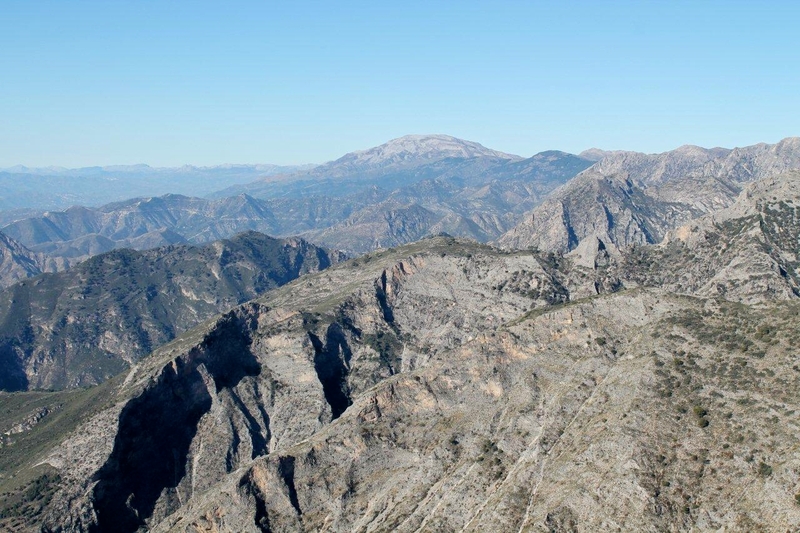 Cielo is the first peak in a range that sweeps off into the Sierra Almijara in a broad arc of bare knobbly humps. Through gaps between the hills I catch glimpses of the snow-clad Sierra Nevada and my old friend Lujar, and to the immediate north the whale-backed Navachica (on the list for next summer, perhaps), the steep-sided Lucero (climbed last summer), and to the west La Maroma, which at 2,070m (6,791ft) is the highest peak in the Sierra Tejeda. 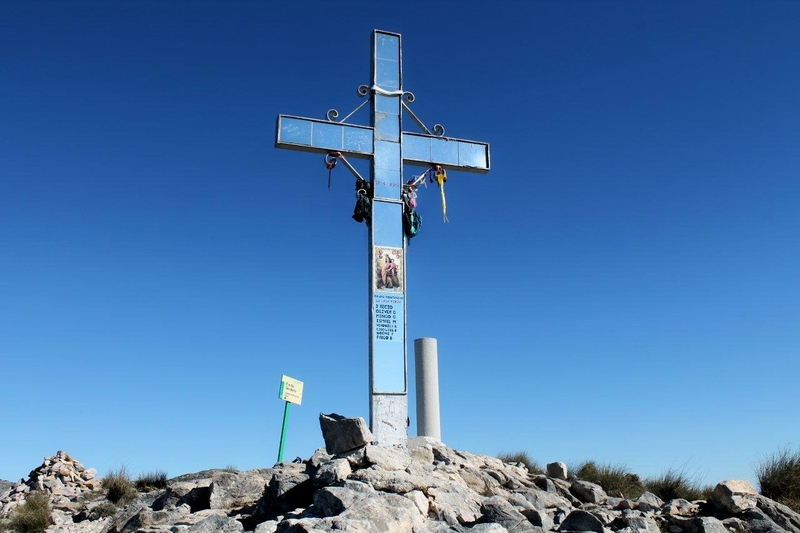 On Cielo’s summit, beneath a tall cross adorned with ribbons, mirrors and a picture of the virgin and child, I lie on the ground and close my eyes. Hard to believe it’s only a couple of days after Christmas and half of Britain is under water. 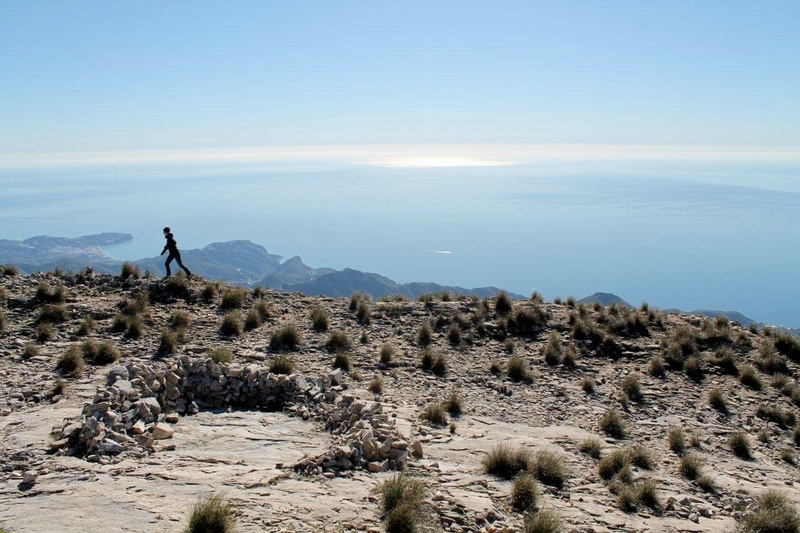 And here I am with this Mediterranean sun beating down and a sweet wind drifting from the piny valleys far below, me and half a dozen silent hikers, each with his or her own thoughts as they gaze out across the sea towards an unseen Africa. This is what life should be about, shouldn’t it? 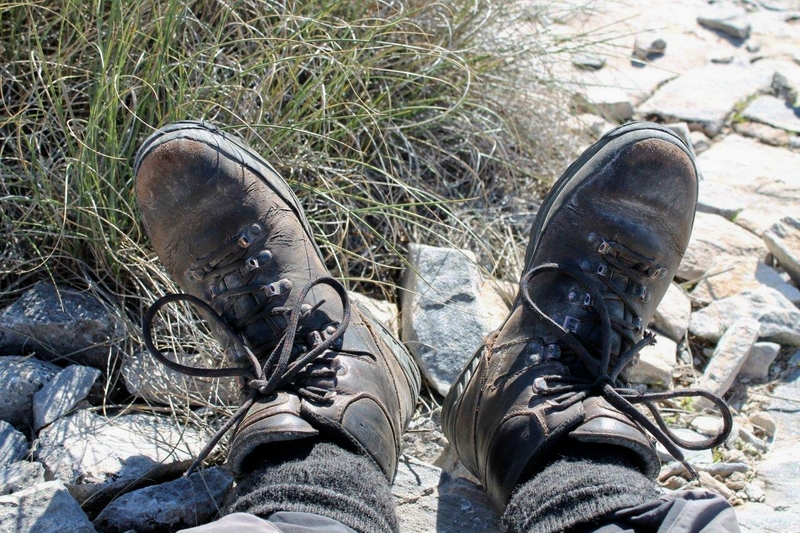 Drifting across the landscape and leaving no trace except the scuff of a boot on the edge of a stone; sleeping with the sun on your face; gazing out across oceans towards the promise of new lands; taking a mouthful of water and breaking bread on a mountaintop you’ve never visited before and will never visit again. Perhaps those hippies at Cortijo de la Civilia worked this one out some time ago. 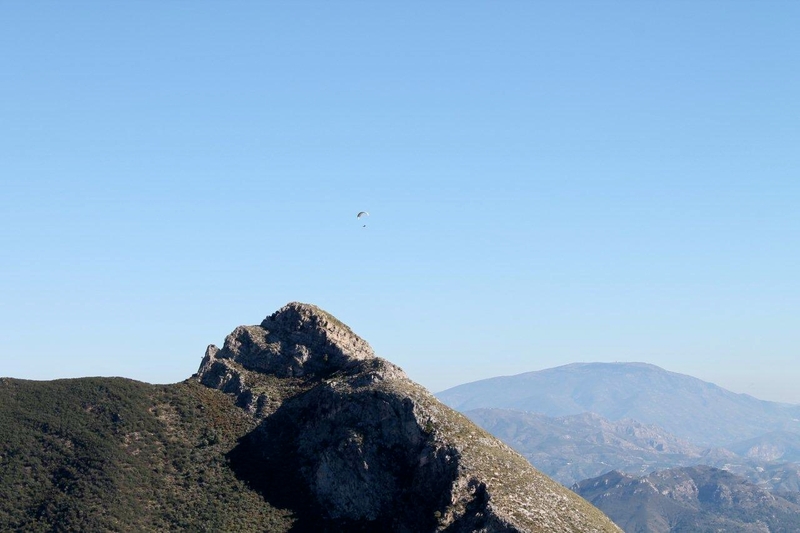 On the way down, halfway along the Cuesta del Cielo ridge, I stop to watch a paraglider circling in the clear blue sky above a rocky knoll, with Lujar looming large in the far distance like an awkward guest at a private party. As he circles slowly, something flickers in the corner of my eye. It’s small, it’s dark, and it moves faster than the wind. It’s a bird swooping for insects – curved wings and forked tail. Nothing would be easier at this point, to wrap up this account with something resembling symmetry, than to employ a little journalistic licence and say it’s a swallow. But it isn’t. I can’t tell a fib. Not after breaking bread under the watchful gaze of the virgin and her son. It’s a swift that for some reason has lingered in Spain. But hey, what’s the next best thing to a swallow (don’t say a house martin)? Exactly. BACK in rain-soaked Britain, a little internet browsing has revealed Capistrano to be either a village that was subsumed by Nerja or a suburb of the holiday resort. Either way, and somewhat unfortunately, it is not the Capistrano of the Ink Spots song. That doesn’t stop us indulging ourselves here. In fact, it adds to the flavour. Take it away boys. Uno, dos, tres . . . 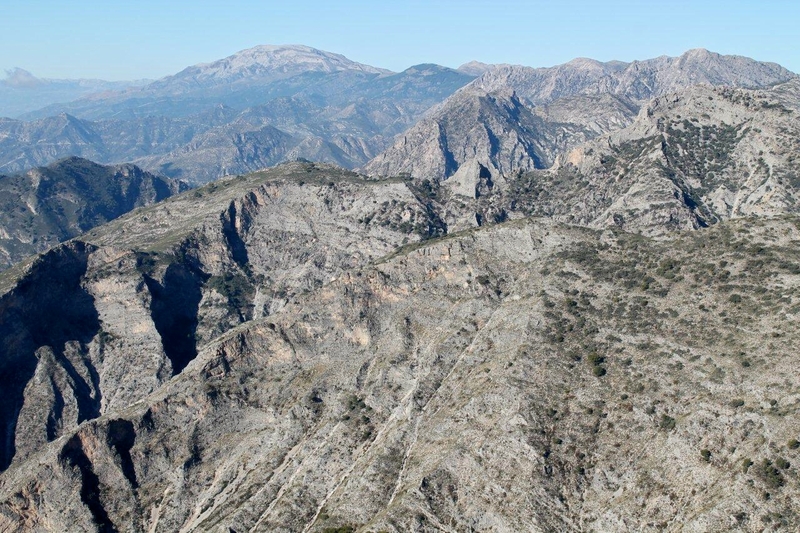 This entry was posted in Caving, Climbing, Environment, Hiking, Ink Spots, Mountains, Music, Potholing, Walking and tagged outdoors, Sierra Nevada, Sierra Tejeda y Almijara, Spain. Bookmark the permalink. Lovely story from beginning to end. Hej Hanna. Thanks for that. That’s the advantage of having invisible friends. They don’t drink your beer. But they can keep you awake at night. Your blog brought back memories of a holiday we had in these mountains in 2011. We went up Cielo on one day. Have you ever been to Acebuchal, a village that was evacuated by the civil guard to deny assistance by locals to the guerillas you have posted about in previous posts. Its used by vacationers now, providing holidays homes and has a bar/restaurant. 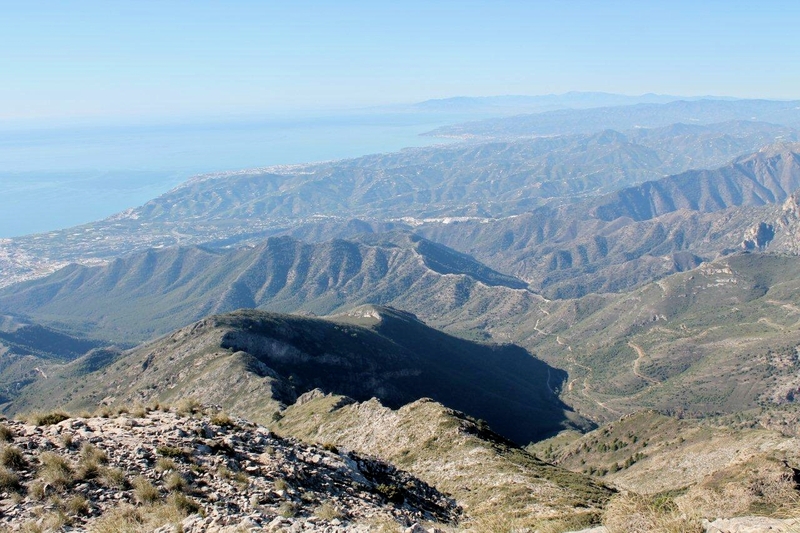 Another walk we did began in Frigiliana and went over El Fuerte and down to Acebuchal for a cold beer to finish. Hi Chris. 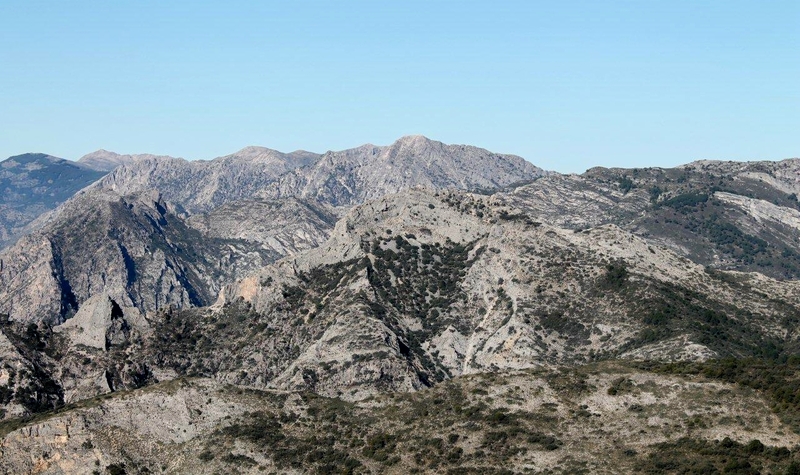 I must admit I’ve never been to Acebuchal, but I’ve seen it from the track up to Puerto de Frigiliana because I parked my car in an old marble quarry above the village and I remember it looked a pretty interesting place. 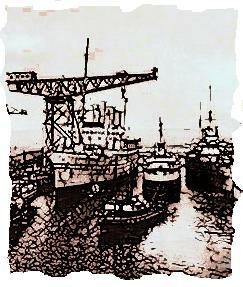 Next time we’re over there we’ll have a proper look. I’ll also look it up in David Baird’s book, Between Two Fires, about the guerrilla war because I’m sure he mentions it. 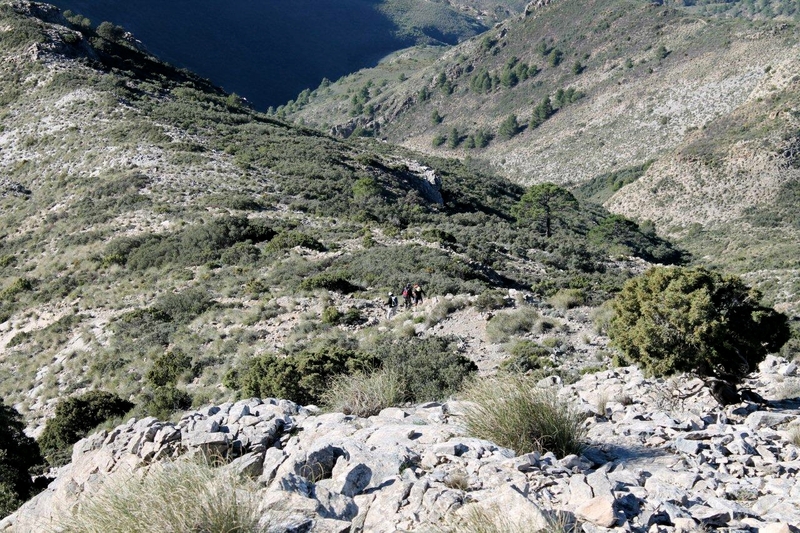 The El Fuerta walk sounds good, especially with the cold beer at the end. Hi Dohn. Thanks for that. Its a nice way to finish. I should mention that when we were there it was September and I was told the bar closed sometime in October for a while. Not sure it that still applies. Thanks for that, Chris. There’s nothing worse when you’re gagging for a drink than to turn up at a bar and find it closed. Looks an interesting area to explore Alen. 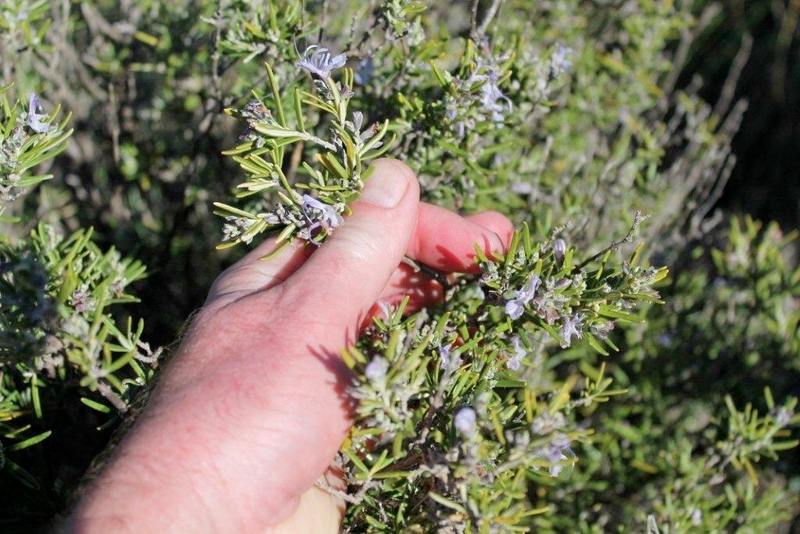 Nice to see that Rosemary is already flowering in the mountains. Like the smell of Thyme, Rosemary often reminds me of spring walks in the Spanish hills. Hi David. 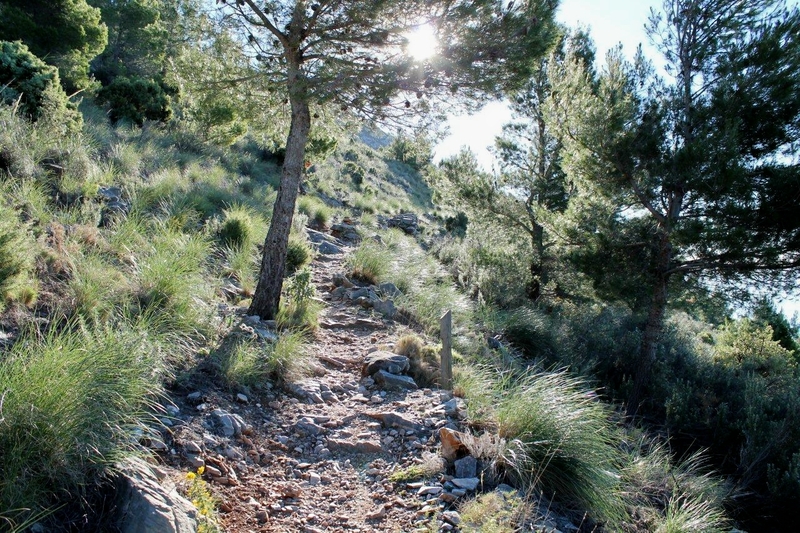 The scent of wild herbs on the breeze is one of the things that makes walking in Spain a magical experience. I’ll add lavender to that list. There are probably many others that I don’t know the names of. it’s a subject I really should get more familiar with.